There’s a new holiday (only in the sense that we hadn’t previously made note of it–this one’s been around for quite a while) to talk about here at TSL. It’s called The Days of the Dead, or Dia de Muertos–a Mexican holiday, primarily, but other cultures celebrate it as well. And no, it’s not about partying with zombies; it’s a time to gather with our friends and family to appreciate one another’s love and support, and to honor those who are no longer with us. That’s a sentiment that we can certainly get behind! 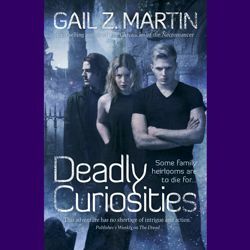 Gail Z. Martin runs a blog tour every year during this time, with lots of free fiction giveaways, interviews, computer wallpaper, contests, and more. We’re honored to have her here today, talking about her Deadly Curiosities urban fantasy series–which is absolutely excellent and really ought to be picked up by anyone into spooky, fast-paced UF. Read on! Here’s a pumpkin-spice latte hot chocolate with no seasoning in it at all, and a plate of your favorite cookies. Pull up a big ol’ overstuffed chair and prepare to be seduced into a new series. In my Deadly Curiosities urban fantasy series of books, Trifles and Folly is an antique and curio shop in Charleston, SC that exists to get dangerous magical items off the market and out of the wrong hands. Cassidy Kincaide is the proprietor, and she’s a psychometric, someone who can read the history of objects by touch. Together with her assistant, Teag Logan, who has his own magic and her business partner, Sorren, who is a nearly six hundred year-old vampire, Cassidy and her team intervene when it turns out that there’s a touch of evil or a hint of haunt lingering over old trinkets or heirlooms. I grew up going to antique stores, used book stores, flea markets, and museums as a kid. When I was amusing myself at an antique store or flea market, I would wander the aisles looking at the old and unusual items. I loved finding out what strange pieces actually did, and when certain objects caught my eye, I made up stories about where they might have come from and who might have owned them. Sometimes, old objects seem to already know they should belong to us. If you’ve ever walked into a store like that and had a particular item just seem to call your name, you know the feeling. And if you’ve ever put a family heirloom into a drawer or tucked it away in storage because it made you feel uncomfortable, or put a piece in a prominent place because seeing it made you happy, you know the kind of connection antiques can make with your soul. Those experiences all shaped my Deadly Curiosities world, and influenced me as I created the magic and danger behind that world. The first book in the Deadly Curiosities series came out in June of 2014, and I’m working on the second book for a Fall 2015 debut. But the books actually happened because of a short story, Buttons, that I wrote for Solaris Books award-winning anthology, Magic: The Esoteric and Arcane. The editor liked the story so much he asked if I could do a series in that world. And while Buttons is set in modern-day Charleston, as is the Deadly Curiosities series of books, that story actually grew out of a fictional universe I had invented for prior anthologies, with stories set in the 1500s and 1700s. Fast forward a little, and I’m still writing Deadly Curiosities short stories for anthologies. Retribution appears in Athena’s Daughters from Silence in the Library Publishing, and The Restless Dead is included in Realms of Imagination from Dark Oak Press. Buttons has been reprinted in three different anthologies. There’s also a free Deadly Curiosities novella, The Final Death, on Wattpad. Leona sez: Check out the post Gail wrote on Goodreads about switching from short to long formats! Last year, I started writing stand-alone Deadly Curiosities stories and bringing them out on Kindle/Kobo/Nook. These stories include some set in prior centuries, but most tell about new exploits of Cassidy, Teag, and Sorren, falling before, between, and around the books in the series. Each story runs about thirty pages, so there’s plenty of room for magic, thrills and chills. You don’t have to read the stories to enjoy the books, but if you do choose to read the short stories, you’ll learn a lot more about the characters and my slightly altered version of Charleston. Right now, there are over a dozen Deadly Curiosities short stories on ebook, with more to come. I’m having a lot of fun imagining new adventures. Every time I go into a museum or flea market, I spot new objects that would be perfect as the centerpiece of a new story. My Days of the Dead blog tour runs through October 31 with never-before-seen cover art, brand new excerpts from upcoming books and recent short stories, interviews, guest blog posts, giveaways and more! Plus, I’ll be including extra excerpt links for stories and books by author friends of mine. And, a special 50% off discount from Double-Dragon ebooks! You’ve got to visit the participating sites to get the goodies, just like Trick or Treat! Enjoy an excerpt from Bad Memories, one of my Deadly Curiosities Adventures short stories here. And a bonus excerpt from Among the Shoals Forever, another of my Deadly Curiosities Adventures here. And a second bonus audio reading from my friend David B. Coe’s The Witch of Dedham here. Gail Z. Martin can be found on Twitter (@GailZMartin), Facebook (/WinterKingdoms),Google+ (+GailZMartinAuthor), YouTube (/ghostwriter45), and even has a newsletter (go to her site to sign up).